When you start to watch this video, you’re going to think that it’s footage from some hidden camera in a bathroom set up by a pervert. Or perhaps hacked from someone’s hard drive and then uploaded onto the internet. But keep watching, and pay attention to what’s happening in the background. It’s not what you think. America alone wastes 1 Trillion gallons of water every year. That’s nearly 3 billions gallons wasted every day. We take our abundant water supply for granted. We do not think about conserving water because for most people in this country, the idea of a drought is a million miles away. But for people in some of the poorest parts of the world – in Africa and Asia, for example – any water supply, let alone a clean one, is a luxury. It’s time that Americans started to think about water conservation. The tragic thing is that much water wastage is completely avoidable. 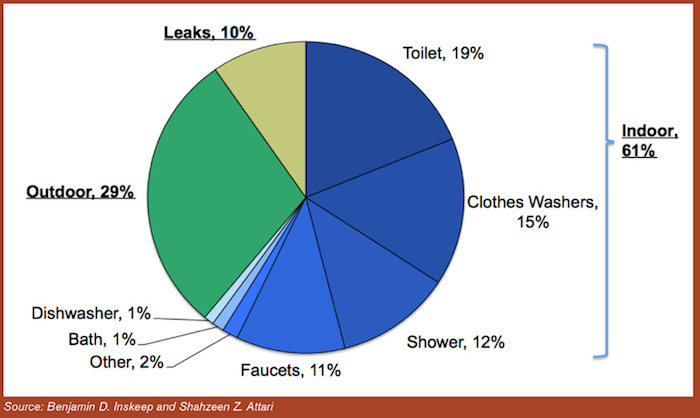 As the graph shows below, leaks, unnecessary toilet flushing, overlong showers and leaving taps on constitutes over 50% of total water waste. That’s 500 billion gallons a year! So let’s start conserving our water now, folks! Previous articleKristen Bell ‘Phones A Terminally Ill Girl As Anna From Frozen, And Dad Catches It All On Camera! Next articleWoman Solves Arson Case Live On TV!